The CoPPP team recently discovered through an ambitious sevenfold-blind-review that it is incredibly hard to differentiate between ten brands of beer not even between the categories Pils and Kölsch. Members of the CoPPP brought selected beers from Portugal, Belgium, the wonderful Schwabenländle, the Westerwald, Cologne, Einbeck, Brunswick, East Friesland, Dithmarschen and Flensburg into the contest. Einbecker Brauherren Pils was the overall favourite of CoPPP. We are open to accept sponsorship by the Einbecker brewery in the future. After a nice dinner the CoPPP practised traditional nine-pin bowling under the watchful eyes of John Wayne. The Chair of Comparative Politics and Public Policy presented its research at this year's ECPR conference at the University of Hamburg. In the well attended section of "Advancing Frontiers in Policy Process Research", Johanna Hornung and Nils C. Bandelow presented their paper "Content Stability and Change Through New and Old Programmatic Elites", which was created as part of the ProAcTA project and the related development of the Programmatic Action Framework (PAF), in the panel "Cross-Fertilization and Integration of Theories into Policy Process Frameworks". It discusses the relationship between programmatic changes within policy areas, the networks and interests of collective actors as programmatic elites and long-term policy developments in policy areas. Malte Möck and his co-authors Colette S. Vogeler, Nils C. Bandelow and Boris Schröder-Esselbach introduced their paper "Polycentric Governance and Spatial Misfits in the Water-Food Nexus - The Case of Groundwater Nitrate Concentrations in Agricultural Hubs in Germany" in the panel "Examining Institutional Adaptation Through the IAD Framework". It emerged from the Metapolis project and demonstrates the challenge of spatial allocation of EU institutions for the sustainable management of food and water resources, based on the high nitrate levels in groundwater resources in parts of northern Germany. Another paper was presented by Colette S. Vogeler and her co-authors Malte Möck, Nils C. Bandelow and Boris Schröder-Esselbach in the section "Contested Boundaries in Food and Agricultural Governance". Their paper "Barriers to Sustainable Governance in the German Livestock Sector - Reconnecting Water and Food Policy subsystems" was part of the panel "Normative Divides in Post-Exceptional Agri-Food Governance". It applies the Social Ecological Systems Framework to illustrate the still relatively unconnected policy making of agricultural and water policies. This leads to negative results and prevents the sustainable management of resources. At the roundtable on "Disseminating the Knowledge of the Policy Process Research", which featured editors from many of the most established and emerging policy research journals, Nils C. Bandelow presented the European Policy Analysis (EPA) journal, whose editorial team was additionally represented in the audience by Fritz Sager and Johanna Hornung. The editors discussed the challenges and opportunities of journal management and talked about useful tips for potential authors for a successful publication. The sections were well attended not only by European, but also by international political scientists. Existing contacts could be deepened and new contacts established. The Chair of Comparative Politics and Public Policy will give four lectures at the ecpr General Conference in Hamburg which starts next week on Wednesday the 22nd and ends on Saturday the 25th of August. A list of our lectures can be found here. The ProAcTA team recently held a three-day long project meeting in Montpellier. In spite of the pleasant weather and the charming southern French lifestyle the team used the first day to discuss the theoretical and methodological foundations of the Programmatic Action Framework (PAF). The second day was used to compare preliminary results and institutional specialities in the studied cases. Day three was used for future planning and the identification of challenges. Nils C. Bandelow und Johanna Hornung recently presented at the annual workshop of the International Public Policy Association new knowledge about Psychological Perspectives on Individual Actors in the Policy Process and about the Programmatic Action Framework. The workshop also served as a ProAcTA team meeting. 2017 brought about many changes in and around our team. Most visibly, we changed our name to “Comparative Politics and Public Policy” (CoPPP) in order to illustrate more clearly our working fields. Further changes concern our projects: As the year ends, our former main project on escalation research with interdisciplinary partners in Braunschweig, Göttingen, and Hannover, funded by the Volkswagen Foundation, ends as well but we were able to already start, receive, and plan several continuing works. (Almost) the entire project team applied for further financing of research with a slightly different focus. In any case, escalation research remains one of our core themes. Within the area of sustainable regional development, we even expanded our research activities. Besides our participation in the project team of “Metapolis”, of whose four-years funding not even half of the time passed, we started the project “QuartierMobil” in autumn 2017. We appreciate this new research cooperation with academic and practice partners in Frankfurt, Darmstadt and Dortmund. In the broadest sense, our participation in the research cooperation “AgroEcoSOS” (Agroecological Solutions for Safe and Fair Operation Spaces of Agricultural Systems in the Urban-Rural Transition Zone) also belongs to this specialization on sustainable regional development. AgroEcoSOS consists of a team around Boris Schröder-Esselbach, which just attracted a currently running start-up financing that hopefully develops into a long-term cooperation with many old and new partners. 2017 allowed to equally expand our activities regarding the basic research in political science. Together with co-editors in Bern, Munster, and Vienna, we are responsible for issuing the international journal “European Policy Analysis” (EPA) under the aegis of the Policy Studies Organization (PSO). At the beginning of the year, EPA moved to the publishing house Wiley, thereby temporarily assuring open access to the journal contributions within the network of the TU Braunschweig. At the turn of the year, we enthusiastically received funding for the DFG-ANR project “ProAcTA” (Programmatic Action in Times of Austerity). Within this project starting in April 2018, we will cooperate with mostly French colleagues and friends to do research on comparative health policy for three years. Raising projects is not an end in itself but the basis of our work which ultimately should lead to a far-reaching dissemination of results, both through publications in high-ranking journals and through communication with public and practice partners. During the last months, our research was published or at least accepted for publication in several national and international journals, among others in the Policy Studies Journal, Journal of Comparative Policy Analysis, Review of Policy Research, European Policy Analysis, der moderne staat, and the Zeitschrift für Politikwissenschaft. Further papers are at different stages of review processes of different journals. Our contributions mostly stem from intensive discussion and common works at CoPPP. Before being published, our contributions are usually presented at conferences. In 2017, we participated in conferences in Singapore, Florence, Montpellier, Oslo, and Lisbon, as well as in diverse national conferences like our own final workshop on escalation research. As always, we also tried to make 2017 a year of bringing our research directly to the citizens. Many interviews with newspapers and broadcasting companies contributed to this undertaking. One special highlight: the Niedersachs-O-Mat, which was compiled together with colleagues from Freiburg and Düsseldorf. Despite the short time it was online, the voting advice application for the state parliamentary elections in Lower-Saxony reached over 80,000 users. Among others, this success is due to the great support by the public relations department of the TU Braunschweig. We do not only communicate via established mass media: Both our chair and our journal provide information on up-to-date homepages, Twitter (especially for the scientific communities), Facebook (with more personal information) and Instagram (for our younger friends). 2017’s cooperation with students was enjoyable and exciting, not only directly at our chair. Within the Teach4TU project called “DemoVE” (Demokratie Verstehen und Erleben, engl. : Understanding and Experiencing Democracy), we work together with educational scientists to develop new ways of teaching and learning. Equally instructive were new incentives gained by Nils Bandelow as a visting professor at the university of Vienna. Many institutional changes bring with them personnel changes: A comparison of this year’s and last year’s Christmas picture gives first evidence. At the moment, we are expanding our team and will therefore certainly present many more new faces next December. Finally, the turn of the year gives us the opportunity to thank everyone that made 2017 as great and successful. Hopefully, 2018 will bring further opportunities for exchange across disciplinary and national borders. We wish you happy holidays, many gifts, and a great 2018! Last Saturday, the annual conference of the European Consortium for Political Research (ECPR) ended, which this year took place in Norwegian Oslo. Nils Bandelow, Colette Vogeler, and Johanna Hornung enriched the programme with a contribution on their current research. In their paper, they applied the perspective of social identity theory to explain policy change, taking the vote on assisted suicide in German parliament as an example. During its presentation, the contribution stirred vivid discussion on which factors determine the formation and stability of individual beliefs. Besides the presentation of own research, publication and dissemination of scientific results were a core topic of the conference. Nils Bandelow (co-editor of European Policy Analysis) and Johanna Hornung (editorial office) visited the promotion stand of Wiley. Since the beginning of this year, the EPA team cooperates with the publishing house that came up with an impressive advertising banner. Equally delighting are the new EPA flyers presenting EPA as part of the big PSO (Policy Studies Organization) journal family. Apart from the official conference programme, the COPPP team used the time for exchange with leading and excellent scholars such as Simon Hegelich, Stefan Marschall, Stéphane Moyson, Daniel Nohrstedt, Thomas Saretzki, Edella Schlager, Jale Tosun, Uwe Wagschal, Chris Weible, Philippe Zittoun and Reimut Zohlnhöfer. We look forward to meeting all of them again soon! Last week, the 14th congress of the AFSP (Association Francaise de Science Politique/French Association of Political Science) took place in Mediterranean Montpellier. Nils Bandelow and Johanna Hornung presented a paper delivering explanations for changes in the shares of public spending on health care across the EU after the economic crisis. In their paper, they showed which specific combinations of institutional, path-dependent, political and socioeconomic factors explain policy change in the respective countries. Besides participating in the panel organised by Marie Moncada and Marc Smyrl, they took the opportunity to enhance our partnership with French political scientists. Discussions and meetings with Patrick Hassenteufel and William Genieys and his team contributed to the planned future research cooperation. The conference also enabled interesting insights into the French political science community and research. Explicitly promoting European Policy Analysis among these scholars, we hope to increasingly attract and publish high quality research from France in our journal. Anne-Laure Beaussier, Marie Moncada, Johanna Hornung, Marc Smyrl, Nils C. Bandelow, Chloé Bérut, Amandine Rauly (chairs and presenters of the panel “Health Expenditure Control and Selection of Instruments: A Comparison Among Member States of the European Union”). Conference participants with Andy Smith (president of AFSP) with Caitriona Carter (“first lady”) and the conference organizers William Genieys and Jean Joana. The Chair of Comparative Politics and Public Policy at the TU Braunschweig – subject to final approval – invites applications for a research fellow position (at least German tariff 0,5 TV-L 13 to begin with) in political science within a transdisciplinary research project on the design of quarters in selected German cities. Aims of the project include the development of alternative courses of action to transform urban mobility regarding sustainability, climate protection and the depletion of socio-ecological inequalities. Referring to two selected quarters in the cities of Frankfurt/M and Darmstadt, results strive for relevance to both science and planning processes. The candidate should pursue a PhD related to the project. Depending on the applicant situation and the availability of funds, the hiring of two candidates is possible. The anticipated project duration is from October 2017 to August 2020. A prolongation of the working time and possibly an associated extension of the task spectrum also including teaching at the department is generally targeted. Options for continued employment will be considered after the completion of the project. disposition for business trips to gather empirical data within Germany. The TU Braunschweig aspires to increase the share of women and strongly invites women to submit their application. In case of equal qualification, severely disabled applicants are preferentially hired. Please send your application in exclusively digital format (ideally as a single pdf file including all documents) until 15th July 2017 to Nils.Bandelow@tu-braunschweig.de. European Policy Analysis (EPA), the double-blind peer-reviewed journal that is co-edited by our chair, is now successfully published with Wiley. This cooperation is thanks to the American Policy Studies Organization (PSO), which is also responsible for a number of other leading journals in our field. Among other articles, the spring issue 2017 includes an essay by Nikolaos Zahariadis on „Migrexit and its Consequences for the European Union“ and a contribution titled „Farm Animal Welfare Policy in Comparative Perspective“ by Dr. Colette Vogeler. EPA presents European perspectives, approaches and subjects of policy analysis. For further information on EPA, visit www.politikfeldanalyse.de and follow EPA on Facebook and Twitter. On 9th May 1950, the then French foreign minister Schuman gave his famous speech that led to the German-French European Coal and Steel Community and thus to the first steps of the E uropean Union. Today, 67 years later, the same union is questioned more than ever: discussions on resignation, populism and disputes among the members determine the reporting. It’s high time to feel the pulse of the state alliance. Together, the Chair of Comparative Politics and Public Policy and the Chair of International Relations used yesterday’s Europe Day as an opportunity to discuss with invited experts and an interested audience the future of Europe. The run-off for the presideny in France, which took place on Sunday, caused plenty of conversation topics. Johanna Kuhlmann moderated the event, accompanied by French specialities like croissants, baguette, spread and diverse drinks. French political scientist Prof. Patrick Hassenteufel opened the event via video link from Paris. In his interview with Prof. Nils C. Bandelow, the political scientist who is conducting research in Versailles portrayed his impressions from the presidential election and his forecasts for the upcoming election of the national assembly. Afterwards, the audience had the possibility to take the spot in front of the video camera and ask Mr. Hassenteufel their questions. Then, the research assistants of the Chair of Comparative Politics and Public Policy presented their posters. That way, the audience was able to fundamentally catch up on the system and the situation of Europe and France. Thomas Roth, deputy chief editor of the Braunschweiger Zeitung, was invited to the subsequent open forum. In his dialogue with Prof. Nils C. Bandelow and changing discussion partners, he especially elucidated the handling of right-wing populist movements and the role of the media in this regard. Out of this, the vivid debate with the audience formed the end of the event. As a conclusion, the session provided new stimuli and perspective on the topic – albeit not finally answering the future of Europe question. Which relevance do the French elections hold for Europe? In the light of events, the Chair of Comparative Politics and Public Policy together with the Chair of International Relations hosts a breakfast event with discussion on the 5th of May 2017, from 10 am to 12:30 am in room BI 97.8. An open forum including Prof. Dr. Jakobi, Prof. Dr. Bandelow and a secret guest will discuss the future of Europe, the election results in France and their expected consequences. Prof. Dr. Patrick Hassenteufel of the Université de Versailles Saint-Quentin will enhance an interactive debate via Skype. Our event welcomes interested participants to join the discussion. A free and typical French breakfast will complement the political input. Renaming "Comparative Politics and Public Policy"
Prof. Dr. Nils C. Bandelow and Dr. Colette S. Vogeler published a contribution entitled “Why do protest movements escalate?” in the new issue of the “Politikum” magazine. Politikum is a magazine addressing actors from the realm of practice and society aiming at providing its readers intensified access to political core questions on a scientific basis. 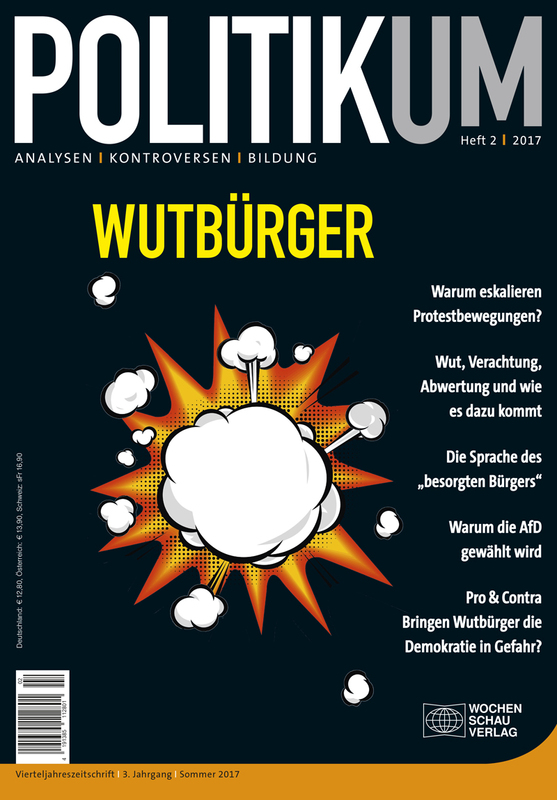 The current issue published in April deals with the “enraged citizen” (German: “Wutbürger”). Hence, we were able to deliver interesting insights into the incurrence and roots of conflict escalation, based on our project on escalation research and the communication of large infrastructure and construction projects. The article thus essentially contributes to the transfer of research results into practice. Find the link to the article here. Our chair supervises bachelor and master theses on all chair-related topics. An updated list of topic suggestions was just downloaded and can be found here. Self-developed suggestions and ideas are equally welcome. We especially appreciate supervision of theses concerned with our current research interests, such as comparative politics, escalation research, health policy, policy analysis, political communication, EU politics, transport policy, industry policy, education policy and regional policy. In addition to that, we foster the cooperation with practice partners, e. g. coming from regional industry, foundations, regional development centres, unions and parties. As part of the BMBF project teach4TU, the proposal “DemoVE – Demokratie verstehen und erleben” (engl. : “Understanding and Experiencing Democracy”), initiated by the chair for politics (Prof. Dr. Nils C. Bandelow) and the institute for educational science (Prof. Dr. Katja Koch) was approved. The project together with students develops an E-Learning event on democracy and democratic education. Subsequently, the learning concept may be used by all students to familiarize with democratic processes and possibilities of participation in personal proximity (university, company, school, municipalities). Especially the Blended-Learning-Approach and the incorporation of students into the conception were convincing in the review process. In the summer term of 2017, the students will then have the possibility to attend two seminars (combi-seminar) on democratic theory and media communication in the pool of interdisciplinary qualifications or the professionalization of Faculty 6. Responsible contact partner at our chair is Malte Möck, M. A. On the 23th and 24th January, the symposium of the funding program “Science for Sustainable Development”, financed by the Volkswagen Foundation and the Science and Culture Ministry of Lower Saxony, took place in the castle Herrenhausen in Hannover. The researchers of the funded sub-projects met there to exchange and inform about their state of research with further experts and the interested public. Besides many other exciting projects on sustainable research, the project METAPOLIS had the occasion to present itself. Prof. Dr. Vanessa Miriam Carlow of the Institue for Sustainable Urban Construction and Prof. Dr. Boris Schröder-Esselbach of the Institute of Geoecology first presented the current state of research and afterwards discussed chances and challenges of their work in an open forum. Within the scope of poster sessions, our chair team consisting of Prof. Dr. Nils C. Bandelow, Malte Möck and Dana Tholen presented its work. The inter- and transdisciplinary research project METAPOLIS started in April 2016. Together with our chair, researchers of geoecology, architecture and business informatics as well as the Institute of Building and Solar Technology and the Institute of Fluid Mechanics investigate urban-rural relations in Lower Saxony over the next four years. We aim at showing strategies of sustainable design in these relations. Our chair is represented in the project by the sub-project “Governance”. It focuses on the interaction of political actors during formulation, decision and implementation of sustainable strategies. At the end of the year, another issue of EPA has been published. The journal is openly accessible online: http://www.ipsonet.org/publications/open-access/epa. Under the aegis of the American Policy Studies Organization, the double-blind peer-reviewed journal is edited by a team from Braunschweig, Vienna, Bern and Muenster. EPA presents European perspectives, approaches and issues of policy analysis. From 2017 on, EPA will cooperate with the publishing house Wiley. Further information on EPA can be found on http://www.politikfeldanalyse.de, on Facebook and Twitter.